Our sweet friend and babysitter-for-years, Anna, is an accomplished crochet-er. What's the noun for someone who crochets? Crochet-ist? I have no idea. But she's REALLY good at it. She gave us several adorable pieces when Jake was born, and every year for Christmas she's given us beautiful handmade ornaments or accessories for our home that are truly one-of-a-kind. Yesterday she surprised us by dropping by our pool and bringing a basket full of handmade goodies for our baby girl! Everything was packaged in this custom wicker basket, which will be a great additional storage piece in the nursery. 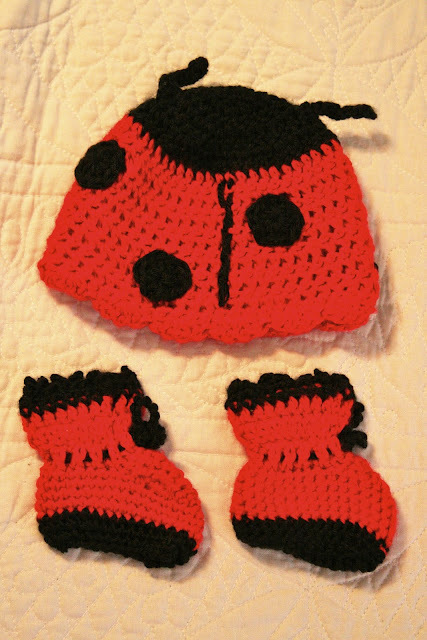 And a ladybug set, complete with antennae on the hat! We feel so blessed to have such a generous friend who loves our kids as much as anyone outside our family possibly could. To our friend and faithful blog reader, Anna, THANK YOU! LOVE LOVE LOVE the ladybug set! So cute!! !